Born March 27th, 1963, director/screenwriter/actor/producer Quentin Tarantino was perhaps the most distinctive and volatile talent to emerge in American film in the early '90s. 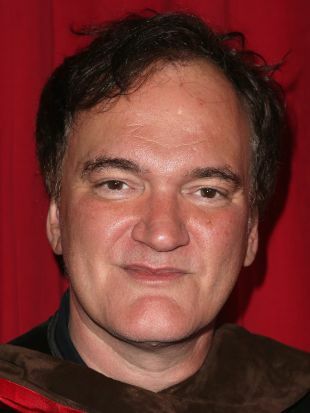 Unlike the previous generation of American filmmakers, Tarantino learned his craft from his days as a video clerk rather than as a film-school student. Consequently, he developed an audacious fusion of pop culture and independent arthouse cinema; his films were thrillers that were distinguished as much by their clever, twisting dialogue as their outbursts of extreme violence. Tarantino initially began his career as an actor (his biggest role was as an Elvis impersonator on an episode of The Golden Girls), taking classes while he was working at Video Archives in Manhattan Beach, CA. During his time at Video Archives, the fledgling filmmaker began writing screenplays, completing his first, True Romance, in 1987. With his co-worker, Roger Avary (who would later also become a director), Tarantino tried to get financial backing to film the script. After years of negotiations, he decided to sell the script, which wound up in the hands of director Tony Scott. During this time, Tarantino wrote the screenplay for Natural Born Killers. Again, he was unable to come up with enough investors to make a movie and gave the script to his partner, Rand Vossler. Tarantino then used the money he made from True Romance to begin pre-production on Reservoir Dogs, a film about a failed heist. Reservoir Dogs received financial backing from LIVE Entertainment after Harvey Keitel agreed to star in the movie. 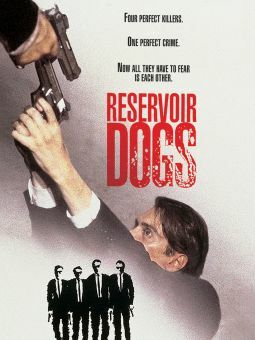 Word-of-mouth on Reservoir Dogs began to build at the 1992 Sundance Film Festival, which led to scores of glowing reviews, making the film a cult hit. While many critics and fans were praising Tarantino, he developed a sizable number of detractors. Claiming he ripped off the obscure Hong Kong thriller City on Fire, the critics only added to the director/writer's already considerable buzz. During 1993, Tarantino wrote and directed his next feature, Pulp Fiction, which featured three interweaving crime storylines; Tony Scott's big-budget production of True Romance was also released that year. In 1994, Tarantino was elevated from a cult figure to a major celebrity. 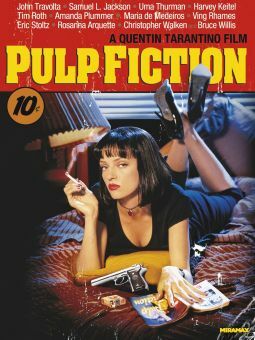 Pulp Fiction won the Palme d'Or at the Cannes Film Festival that May, beginning the flood of good reviews for the picture. Before Pulp Fiction was released in October, Oliver Stone's bombastic version of Natural Born Killers hit the theaters in August; Tarantino distanced himself from the film and was only credited for writing the basic story. Pulp Fiction soon eclipsed Natural Born Killers in both acclaim and popularity. Made for eight million dollars, the film eventually grossed over 100 million dollars and topped many critics' top ten lists. Pulp Fiction earned seven Academy Award nominations, including Best Picture, Best Director, Best Original Screenplay (Tarantino and Avary), Best Actor (John Travolta), Best Supporting Actor (Samuel L. Jackson), and Best Supporting Actress (Uma Thurman); it won one, for Tarantino and Avery's writing. After the film's success, Tarantino was everywhere, from talk shows to a cameo in the low-budget Sleep With Me. At the beginning of 1995, he directed a segment of the anthology film Four Rooms and acted in Robert Rodriguez's sequel to El Mariachi, Desperado, and the comedy Destiny Turns on the Radio, in which he had a starring role. Tarantino also kept busy with television, directing an episode of the NBC TV hit ER and appearing in Margaret Cho's sitcom All-American Girl. The latter half of the '90s saw Tarantino continue his multifaceted role as an actor, director, screenwriter, and producer. In 1996, he served as the screenwriter and executive producer for the George Clooney schlock-fest From Dusk Till Dawn, and the following year renewed some of his earlier acclaim as the director and screenwriter of Jackie Brown. The film, in which Tarantino had a voice-over cameo, reunited him with Fiction star Samuel L. Jackson and won him the raves that had been missing for much of his post-Fiction career. Also in 1997, Tarantino appeared in Full Tilt Boogie, a documentary about the making of From Dusk Till Dawn. His film work the following year was essentially confined to a role in friend Julia Sweeney's God Said, Ha!, and in 1999, he was back behind the camera as the producer for From Dusk Till Dawn 2: Texas Blood Money. Though Tarantino would lay relatively low in the early years of the new millennium, he did make a prominent guest-starring appearance in 2001 on a two-episode story arc of the spy show Alias. In late 2002/early 2003, hype would soon start to build around his fourth feature, Kill Bill (2003). Though originally envisioned to be a single release, Kill Bill was eventually seperated into two films entitled Kill Bill Vol. 1 and Kill Bill Vol. 2 when it became obvious that the story was simply too far-reaching to be contained in a single film. A kinetic homage to revenge movies of the 1970s, Kill Bill Vol. 1 featured Uma Thurman as a former assassin known as "The Bride." While the first film in the pair was an eye-popping homage to Asian cinema and all things extreme, the outrageous violence of Kill Bill Vol. 1 stood in stark contrast to the dialogue-driven second installment that concluded the epic tale of revenge and betrayal. The gambit of separate releases paid off, as both earned a combined sum of more than 130 million dollars domestically. In the wake of the Kill Bill films, rumors abounded concerning Tarantino's next feature, and eager fans were shocked to see his name mentioned as being a potential candidate to helm everything from the next Friday the 13th film to a remake of the James Bond classic Casino Royale. In 2005, Tarantino did step back into the director's chair to helm a segment of Robert Rodriguez's eagerly anticipated comic book adaptation Sin City. A longtime friend of Rodriguez, Tarantino agreed to take part in the filming of Sin City, not only to repay the versatile filmmaker for providing soundtrack music for the Kill Bill films, but also to try his hand at digital filmmaking -- a process increasingly championed by the seemingly inexhaustable Rodriguez. After this, the two directors joined forces again, for one of the most ballyhooed and hotly anticipated pictures of 2007: Grindhouse. A no-holds-barred elegy to the sleazy, seedy, often half-dilapidated inner-city theaters of the 1970s that would churn out similarly sleazy movies, Tarantino and Rodriguez divided Grindhouse into two portions: the first half, Death Proof, directed by Tarantino, starred Kurt Russell in homage to the high-octane auto thrillers of the '70s. Merging low-brow thrills with blunt, existential dialogue, the Tarantino segment garnered the lion's share of the film's considerable critical praise, although the three-hour-plus Grindhouse ultimately failed to connect with audiences, much to the dismay of The Weinstein Company, who released it. Separate versions of Death Proof and Rodriguez's Planet Terror were then prepped for European release, with Tarantino's effort screened in competition at the 2007 Cannes Film Festival. In 2009 Tarantino issued Inglorious Basterds, a sprawling World War II epic abuot a band of Jewish American soldiers fighting an Apache resistence behind enemy lines in Nazi-occupied France. The film, strring Brad Pitt, was a hit around the world, and garnered Tarantino nominations from the Writers Guild, the Directors Guild, the Hollywood Foreign Press, and the Academy for his screenplay and his direction. He took three years to craft his follow up, Django Unchained, a revenge tale set in the pre-Civil War American south that follows a slave who teams up with a bounty hunter to get his wife away from a sadistic plantation owner. 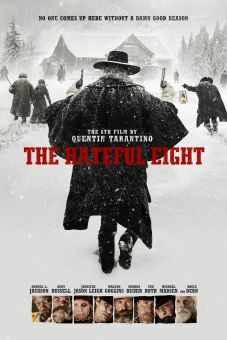 The film was a another international box office hit, and earned a number of year-end awards including a second Best Original Screenplay Oscar for Tarantino. Mother is part Cherokee; gave birth to him when she was 16; the two of them moved from Knoxville to L.A. when he was 2. Dropped out of school in the ninth grade. Spent five years working at a video store in L.A.; a co-worker was future Pulp Fiction writing collaborator Roger Avary. Made his TV acting debut in 1988 as an Elvis impersonator in an episode of The Golden Girls. Loves trashy B-movies of the 1960s and '70s, especially kung-fu and blaxploitation films.